LAS CRUCES, N.M., April 2, 2019 /PRNewswire/ -- Army veteran and Las Cruces resident Trinity Seay wanted to see what he is "still able to do despite having peripheral vision blindness." During a Wounded Warrior Project® (WWP) adaptive sports clinic in Orlando, Florida, he found out there's still a lot he can do. Trinity served in convoy operations in Iraq and has been managing macular degeneration caused by an IED blast in 2007. He also copes with traumatic brain injury (TBI) and neurological issues. He is 80 percent blind and described his condition as similar to "having horse blinders on." 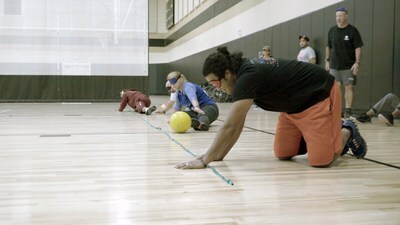 He joined other injured veterans at the adaptive sports clinic for a friendly game of goalball. Using an audible ball containing metal bells inside heavyweight rubber, warriors focused on their ear-hand coordination to compete against other teams of four. The game is played competitively around the world. In adaptive sports, service-related injuries are no longer restrictions, but instead serve as gateways to each warrior's new capabilities and mission in life. "It was a great experience, and I would say to other warriors to look into adaptive sports at Wounded Warrior Project," Trinity said. "Get in touch with adaptive sports trainers, and get out there and explore. You're not as impaired as you might think you are. There's still life ahead of you." Wounded warriors with various physical limitations can participate in WWP adaptive sports. The clinic in Orlando, like other WWP adaptive events around the country, was designed to connect some of the most seriously wounded veterans with adaptive equipment, sports, and exercise routines that are specialized for each warrior's unique needs. After each clinic, warriors receive tools and assistance to continue improving their skills at home in their communities, where they can take part in competitions or join adaptive sports teams.